We are an environmental initiative of University of Guadalajara that was born on 1979, with the discovery of a wild corn relative named Zea diploperennis. This initiative lead to the creation on 1987 of the Sierra de Manantlan Biosphere Reserve, which conducted to a strong collaboration between federal government, university and several local stakeholders. In 1993 the Manantlan Institute started its environmental education program, with Salvador García as coordinator. The solid waste management program initiative soon reached 10 municipalities, as a prelude for the Ayuquila river Intermunicipal Association, an important network of local authorities and stakeholders working together for the conservation of water and natural resources of the Ayuquila watershed. UNU-IAS produced an interesting video of this experience. Rio Ayuquila Anual Fair, Sierra de Manantlan Environmental Education program, forest fires awareness, SUMATE network of citizens, bycicle program, organic farming, electronic wastes management and radio environmental programs. We are different of other RCE located at urban environments and even the capital of a country, we are a rural RCE in a small city named Autlan, by the way the birth place of Carlos Santana the famous guitar player. But we have more than 25 years of experience in regional sustainable development and conservation initiatives. What are we doing in the RCE Network? We participate with our colleagues of America RCEs from Canada, USA, Guatemala, Colombia, Peru, Brasil and Argentina to build up a continental agenda on ESD. Including issues like: Biodiversity, youth participation, teacher training, indigenous communities empowerment in ESD, but also developing communication strategies, exchange programs, living laboratories creation, monitoring, tutorials and sustainable cities projects. When I remember the 3th RCE of America meeting in Autlan last July, and review the statement that we build up together and the strategies we proposed with in the GAP priorities: Advancing policy, integrating sustainable practices into formal education with a system approach, building capacities of educators and trainers, mobilizing youth, enforcing sustainable solutions for local communities, introducing School Agenda 21 in all educational levels and promote an integrated approach to ESD in higher education. I can't avoid an optimistic feeling. Yesterday when I was listening to Lyle, Chuck, Teresa, Eduardo, Amy, Norman and several others having relevant arguments under the lead of Roger and Unni, I realized that after a decade of hard work on ESD, we all know very well where we are now and where we want to be in the future. But as I think about the post decade ESD challenges and the priorities of the brand new Global Action Programme, I start to feel that we are in a race against the clock, because social awareness of sustainability grows slower than the oil burn, the wastes increasing production and water pollution all over the world, and Education is a so slow process, in order to achieve as soon as possible the global learning space of RCE we need to move faster and with more specific actions. And thinking about Americas RCEs and the wide diversity of social and environmental realities that we face, and thinking in the need to upscaling the RCE strategies and good practices in the continent, as I said yesterday at the America meeting, I believe that more than creating an American RCE superstructure it will be better to start one or two continental RCE Projects that can include several or all the RCE in the Americas, with one very specific issue like: youth mobilization, teachers training or indigenous communities empowerment for example, just one at a time. 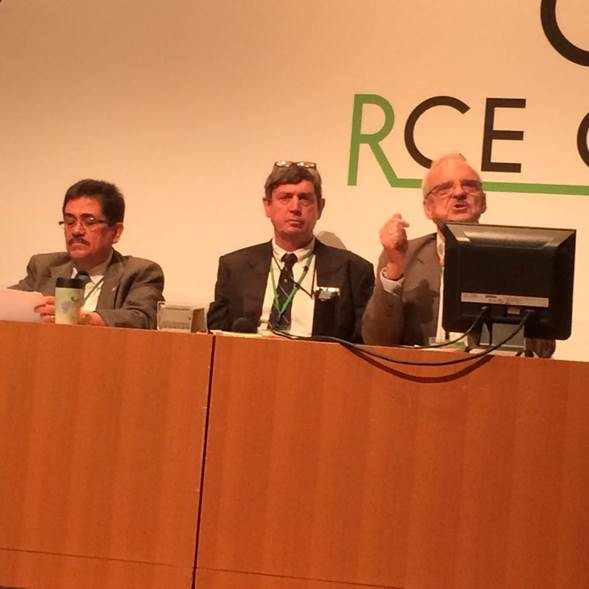 These continental projects can be an important tool to reach common goals in different countries, and will permit an easier access to international funding, they will make possible to share methodologies and good practices strategies in the field, offer a standardized platform to evaluation and assessment of RCE experiences, and will permit to get specific outcomes in a short term. America's Continental RCE Projects could help to accelerate the GAP agenda as much as we all need in the New World.